Leveraged Asset Allocation can increase asset protection, enhance profits and income production in savings and investment portfolios. Low interest rates in many currencies offer perfect Multi Currency Sandwich opportunities. 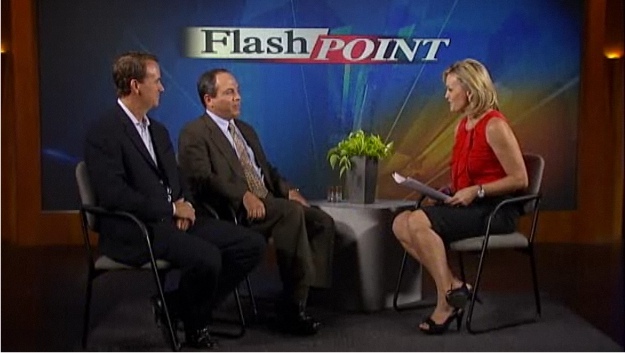 Gary Scott & Thomas Fischer discussing leveraged asset allocation on Danish TV. For example this creates a way to invest smaller amounts with greater profit potential through Jyske Global Asset Management. A basic part of JGAM’s service is to offer three main platforms of asset allocation. The platforms are low risk, medium risk and high risk. JGAM also offers low interest multi currency loans and over the past several years have noticed that leveraged low and medium risk portfolio outperformed non leveraged high risk portfolios. Based on this fact JGAM added an interesting new way to attain asset allocation positions using leverage that increases performance potential and reduces the minimum amounts required. The basis of a platform is normally the balance between fixed income and equity positions. 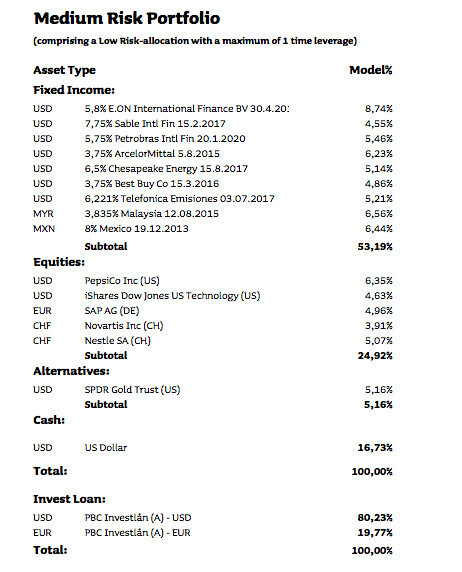 For example currently JGAM’s low risk portfolio has 53.19% of the investments in fixed income and only 24.92% in equities. 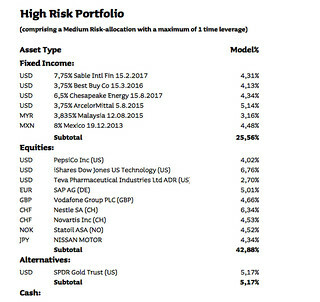 The medium risk portfolio has 25.56% in fixed income and 42.88% in equities. In JGAM’s leveraged asset allocation, investors can keep a low risk portfolio but bump up the potential profit (and risk) by doubling the portfolio wth a low cost loan. The loan by the way is automatic if requested. The portfolio IS the collateral so credit ratings are not a consideration. Here is the JGAM Low Risk Portfolio bumped up to Medium Risk with higher profit potential by doubling the size of the portfolio with a one time low cost loan. You can then enhance the profit potential (with additional risk) by leveraging the medium portfolio one time with low cost loans. The JGAM medium risk portfolio with one time leverage. If you prefer equities to income producing investments you can tweak the performance by bumping up a low cost portfolio with a two times loan. 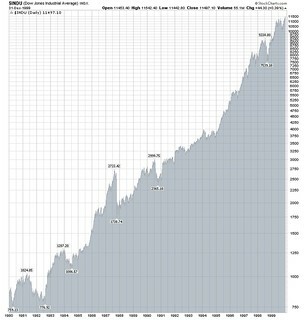 This portfolio has the highest risk and greatest profit potential with two times leverage. These leveraged portfolios are classic Borrow Low – Invest High multi currency sandwich positions that reduce the original amount needed to invest. $200,000 is required as a minimum investment so it requires only $100,000 original investment plus a $100,000 loan to attain the $200,000 portfolio. If one leverages the assets twice then only about $70,000 original investment is needed with a $130,000 loan to reach $200,000. This leverage means that a $70,000 has similar earning capacity to a $200,000 portfolio. All that is lost is the loan cost… currently very low and minimal loan fees. Multi currency loans provide investors suffering from low interest rates to take advantage of this trend and borrow low to invest high. Our report Borrow Low – Deposit High shows how to use Multi currency loans to manage risk and enhance profits. Order Borrow Low – Deposit High, Multi Currency Report here $79. Learn more about “Borrow Low – Deposit High”. I would like to do a Question and Answer on using low costs loans to allocate assets so if you have questions, please send them. Join us for our Super Thinking + Investing & Business Seminar, February 1-2-3 in Mt. Dora, Florida. Meet Thomas Fischer with Jyske who discuses to to leverage asset allocation with low cost loans. We can expect an equity roller coaster in the months ahead. 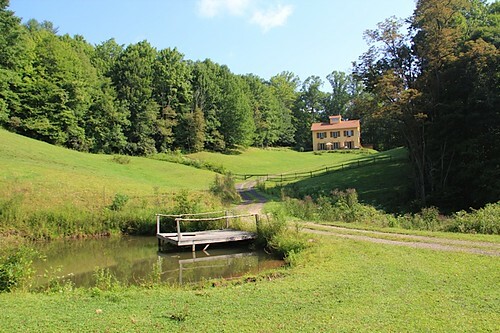 For those who can ride through… there is great potential. See why Jyske has changed its portfolio mix now below. First, may I remind you this is the last day to order Thanksgiving roses until midnight EST. Ecuador roses at our home. 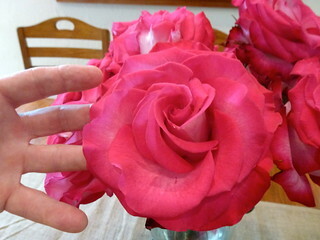 Get details on how to order Ecuador roses here. 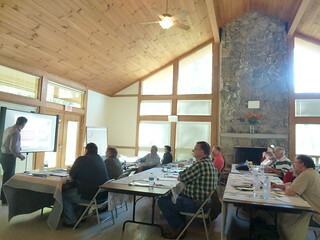 at our most recent Super Thinking + Investing & Business seminar. As mentioned in an earlier post entitled Free Mercedes?, this is the time I have been waiting for… the darkest hour. Boomers should feel truly blessed by this retirement age joy ride. Like many boomers, I began my career in 1968. The US economy was hot and American equities were in their bright hour. Then they crashed…. both US equities and the American stock market. Those starting years taught me a lot about recessions and the downside. There was a recession in the early 1970s… an even worse downturn (the worst since the 1930s) in the 1980s and again a burst stock bubble in the 2000s. Each crash was followed by an even stronger boom. There are never guarantees, but history strongly suggests that the next major incoming tide of prosperity will help boomers (as well as the rest of the world) to enjoy many of our maturing years riding an equity market boom that could rise into the 2030s. That would take me to age 85. If I am still monitoring and writing about cycles then… maybe we’ll have one more big bear warning then. For now the big tide ahead is good news. It’s hard to image a strong equity bull market now. This is the point. The best time to get into equities is always when it is hardest to imagine a recovery. Few investors grabbed the best opportunity at the worst moments in the early 1980s when the US market started its greatest bull rise… ever. Fixed income – underweight – No change. Equities. Change from neutral/moderate overweight to underweight/neutral position. Alternatives. Change from overweight to neutral position. Cash. Change from neutral to overweight position. Many investment analysts and managers that I respect are agreeing that better stock market opportunities are forthcoming. Thomas Fischer Senior VP at Jyske Global Asset Management (JGAM) just sent this note: Gary, I agree – equities seems like a better investment than bonds these days (especially dividend paying stocks). We have our Investment Committee meeting on Thursday and shortly thereafter we will probably produce Advisory recs with some equities. As soon as ready I will forward this list to you. When we receive this list I’ll be passing it onto our Multi Currency subscribers. 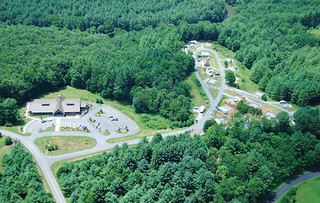 Thomas will join us at our February 1-2-3, 2013 Super Thinking + Investing & Business seminar. See details here. However… even during the boom… there will be ups and downs. These economic tidal shifts are not exact. Maybe the bear trend will last 13 years. Maybe 15 years. Maybe 17? Plus the bull cycle do not just rise. The 15 year cycle is a long cycle with short term fluctuations as this chart of the last major bull market from 1982 to 2000 shows. JGAM outlines one current risk in its recent Market Update that said: This was a post-election week that ended in concern about the fiscal cliff in the U.S. and another “cliff” in Greece. The event of the past week was indisputably the U.S. presidential election. 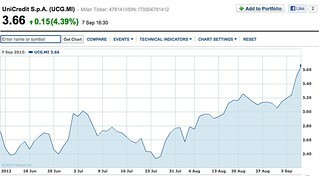 The initial reaction in Europe and Asia to the re-election of Barack Obama was rising stock prices. Apparently, investors were relieved that there will be no change of leadership at the Federal Reserve (Fed), something Mitt Romney had said he would have done. With Ben Bernanke still in the front seat at the Fed, a continuation of a very loose monetary policy should be almost certain. To investors this “guarantee” of liquidity puts a “safety net” – a Fed put – under stock prices. However, the question is what will happen in the long run when growth picks up and excess liquidity finds its way into the real economy, creating inflation and possibly a weak US dollar (USD). But that’s not something most investors worry much about for now. After the initial positive reaction, markets turned to the near term risk of falling off the so called “fiscal cliff”, i.e. the automatic tax rises and spending cuts hitting the U.S. economy in the beginning of next year if an agreement is not reached between the White House and the Congress. If an agreement is not reached in time, then the U.S. economy faces a significant negative shock equivalent to 5% of GDP. Such a hit will push the U.S. into recession. In Europe, Greece faces another “cliff”. Greece and the troika – the IMF, the European Central Bank (ECB) and the EU Commission – are again having difficulties reaching another bailout agreement. If not reached very soon, Greece risks defaulting on a 5bn euro (EUR) debt payment next week. All this uncertainty – both the fiscal cliff in the U.S. and the Greek problem – has put the EUR under pressure. Investors are seeking shelter in USD and government bonds in the U.S. and Germany. One positive news this week was better economic data from China. Data showed industrial output in the world’s second-largest economy to expand by more than expected in October. Maybe, it’s time for investors to turn to this part of the world to escape the looming cliffs in Europe and the U.S.
JGAM is also being cautious in its portfolio structuring. They wrote more about this in their latest portfolio update: On 8 November, the Investment Committee conducted its monthly meeting, reviewing all managed portfolios and investment recommendations. In order to protect the good profit we have had so far this year, we have decided to reduce risk exposure. There are a number of near-term risks that we want to avoid. The fiscal cliff in the U.S. is one challenge and a possible debt default in Greece is another. We have sold the stocks Target and Visa and the oil ETF plus cut by half the gold position. 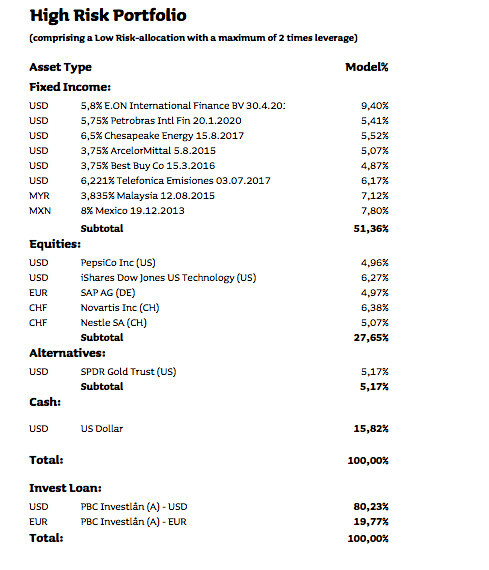 In October we did not make changes to the portfolios except changing the funding on leveraged portfolios from 100% US dollar (USD) to a loan mix of 80% USD and 20% euro (EUR). This mix reflects the currency mix of the investments in the portfolios. Recently, JGAM (Lars Stouge) attended a conference in Brussels, arranged by the Center for European Policy Studies (CEPS) – one of the 10 most influential think tanks in the world. With Commissioner and Vice-President Olli Rehn as the key-note speaker it was an opportunity to get inside the “machine room” of the EU Commission to see and learn how this influential institution thinks and acts. Mr. Rehn was optimistic on the development in the eurozone. He claimed that convergence in unbalances and competitiveness to some extend has already taken place and was convinced that the process would continue, as long as policymakers stick to the strategy of creating and maintaining credibility by pursuing an austerity path. This approach was indeed challenged by other participants at the conference. Especially, professor Paul De Grauwe from London School of Economics was doubtful and accused the Commission of being obsessed by austerity and creating a “homemade recession” in Europe. In his opinion the members of the eurozone should follow an asymmetric macroeconomic policy, allowing surplus (read: Germany) and low debt countries to run debt sustainable fiscal deficits and thereby, helping the heavily indebted members by creating the much needed growth. JGAM’s take-home-conclusion from this top-level discussion is that the eurozone is still in the dark on how to tackle the crisis. The latest development in Greece – where the sovereign debt level is now predicted to go above 190% of GDP – and the sprouting concern on the French economy – one of the core members of the eurozone – does question the austerity path taken by the Commission. Maybe, its critics have a valid argument by claiming the European recession to be homemade and a new type of policy mix should be considered soon, otherwise, the euro itself could be at stake. Another interesting key speaker was Senior Economist Manmohan Singh from the IMF. He presented an eye- opening and brilliant analysis of bank’s balance sheets and monetary policies on a global scale. Since the collapse of Lehman Brothers in 2008 the total volume of collateral pledged among banks has been reduced from 10tn (trillion with a “t”) to 6tr USD, globally. Furthermore, the velocity of collateral – i.e. the number of times a collateral is re-pledged – has dropped significantly because of increased counterparty risk. This means that a substantial deleveraging has taken place outside of the balance sheets of banks, causing a credit squeeze on the real economy and hence, a drag on growth potential. Mr. Singh also convincingly claimed that expansive and unconventional monetary policies (i.e. substantial quantitative easing) has only barely compensated for the shrinking of bank’s off-balance sheets. JGAM’s take-home-conclusion from this insightful analysis is that expansive monetary policies has not been expansive at all, as it has barely compensated for an even larger contracting effect from shrinking volume of available collateral between banks. This leads to the conclusion that deleveraging will take a long time to be completed, as there is no excess liquidity in the system. A Deloitte survey, presented at the conference, confirmed this conclusion, as it unveiled that banks expect deleveraging to extend another 5 to 7 years. This is not good news to those who hope for and rely on growth, i.e. debt oppressed countries – which by the way includes the U.S. with its own version of the eurozone struggle, namely the “fiscal cliff”. The U.S. fiscal cliff is approaching. The eurozone crisis is re-emerging with the risk of (i) another Greek default, (ii) Spain postponing its application for help and (iii) France entering the stage of questionable economies. China changing its leadership and the subsequent uncertainty about policy and growth. We expect the White House and the Congress to come to an agreement on the fiscal cliff threat of automatic tax rises and spending cuts. If an agreement is not made, then running over the edge of the cliff will spark a 5% fiscal contraction next year, pushing the U.S. economy into recession. A more likely scenario is that some tax increases and spending cuts will be postponed leading to a more modest drag on the economy. However, bottom line is that next year the U.S. is going to have a policy mix of easing monetary and tightening fiscal stance. This type of policy mix will result in a continuing low level of interest rates and bond yields, which should be supportive of the stock market. The near term outlook for Europe is not favorable. Even Germany is beginning to feel the consequences of depressed demand. The absence of growth in Europe only amplifies the debt problem among the Southern- European members of the eurozone. As we write this memo it’s up for question whether Greece will default on a 5bn EUR payment this week. It will probably not happen, but we continue to ride on the edge of default, not dealing with the root causes of the crisis. Japan is not offering a better outlook. The latest GDP number shows that the economy is shrinking by 3.5%. The only bright spot seems to be China. However, the government has been somewhat paralyzed ahead of the political handover and therefore, policy easing has been slow. But China has enough fiscal power to make a difference and it has the incentive to use its economic power to create the domestic demand needed to make up for the lack of growth in its export markets. China is definitely an investment area we are going to focus more on in 2013. Based on the near-term risks we have decided to reduce risk exposure and protect some of the good performance we have had so far this year. Fixed income: We keep an underweight position, favoring corporate bonds with a short or moderate duration. Equities: We move from a neutral/moderate overweight position to an underweight/neutral position, still favoring large dividend paying companies. We have sold Target and Visa as these stocks are relatively more dependent on domestic demand compared to the rest of our portfolio. Alternatives: We go from an overweight to a neutral position. We have reduced our gold position by approximately half. Our large gold position was initially taken as a hedge against an unexpected large third quantitative easing by the Fed (i.e. excess liquidity flowing into gold). However, now that we have got the “QE Infinity”, the hedge against the unexpected is not needed. Also, we have sold our oil position. This position was initially taken as a hedge against a Middle East crisis between Israel and Iran. However, after the re-election of Obama we assess the risk to have been reduced. Further, weak global growth outlook puts a damper on the demand for energy. Cash: We move from a neutral to an overweight position. We expect this non-earning cash position in USD to be only temporary, as we expect to enter the Chinese market in the near term and possibly selected undervalued and solid European export stocks. Loan mix: The loan mix is unchanged 80% USD and 20% EUR. Leverage: The gearing level is still below maximum. 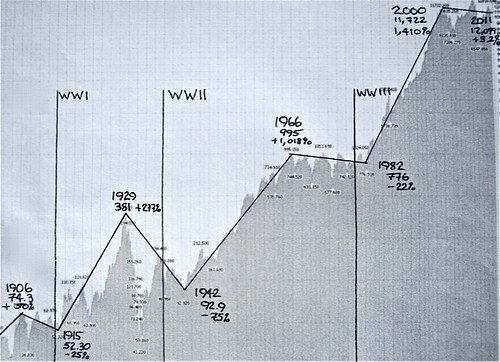 History suggests that a major, long term bull market is about to begin. For those who see this and act… the rewards could be truly outstanding. What if I offered you a free Mercedes Benz? You would probably say YES… but would be thinking… “What’s the catch?” That’s good because we all know there is no such thing as a free lunch… much less a free new car. Would an answer be harder if instead there was a choice… a FREE Mercedes or $4 million bucks (as in US dollars)? Most would choose the cash. Yet of course we would still be expecting a catch. There is a penny to drop… some risk and the need to ignore the thundering herd and an absolute requirement of discipline. The US election is over… but not in the minds of almost half the American voters… who lost. The US as the economic engine that has been pulling the world is a nation divided and the administration for the next four years… good or bad… has huge challenges and pitfalls ahead. The view of the election results in markets around the world was dim. US Stocks plunged and the Dow had its worst day of the year. Other north and South American markets finished sharply lower. Euro markets dropped because the German economy is slowing and tens of thousands at Greek rallies against austerity turned violent. Protesters in Athens threw Molotov cocktails at the Parliament and police fought back with tear gas outside. World markets slid on a weak growth outlook. However, all this bad news can be good for those who are prepared! Let me share a true story about how and why an investor in similar circumstances got the Mercedes and had the $4 million… but then lost it. The story contains three valuable tips… explaining the FREE car plus how the millions were gained and lost. Here is the true story… a tale of politics, economics and US debt. 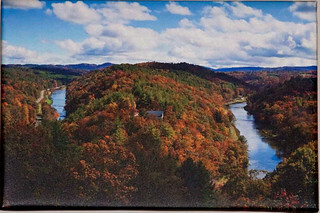 Once upon a time 1981 to be exact… similar circumstances to the current economic and political mess arose across the land. The story began with unemployment. In 1981… the US Presidential election was over, the US economy was crashing and the a new government and president were turning on a money printing machine. This was a dark and gloomy time… those early 1980s. Really. That was the worst recession since the great depression. You often hear we are living now through the worst recession since the great depression. This is statistically wrong. The U.S. economy may seem in bad shape now, but 1982 was worse. The economy is not as bad as it was after the 1980 election. It’s not even that close to being as bad. The ranks of unemployed and underemployed were much larger in 1982 than today. The first big blow to the economy back then was the 1979 revolution in Iran. That glitch sent oil prices skyrocketing. The bigger blow was a series of sharp interest-rate increases by the Federal Reserve, meant to snap inflation. Home sales plummeted. At their worst, they were 30 percent lower than they were when the real estate market bottomed in 2011. The industrial Midwest was hardest hit, and the term “Rust Belt” became ubiquitous. 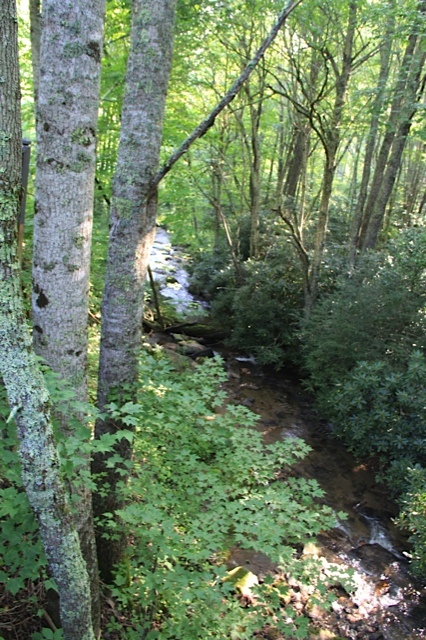 Many families fled south and west, helping to create the modern Sun Belt. Nationwide, the unemployment rate rose above 10% in 1982, compared with 7.9% now. The times were much darker. In October 2012 another 6.7 percent of the labor force can be added to the current 7.9%. This group has given up trying to find a job or are involuntarily working part time. These groups bring the combined underutilized employment rate to 14.6%. As bad as this number is, it is still not that close to the 1982 peak of 16.32% (or anywhere near Depression levels, which were probably above 30 percent). The early ’80s really were that bad. This story begins at the end of the 1980 Presidential election when the US economy was at its worst in 50 years and getting worse. There is another similarity in the 1980 story to the here and now… a runaway US debt. 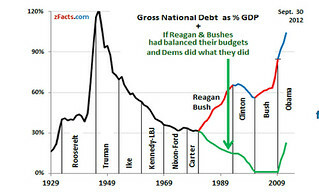 As this chart below shows, the US debt debacle really began after that 1980 election. Now the story begins. The stock market began a 17 year bull cycle that led to the greatest US and global affluence known to the recorded history of mankind. The chart below says it all. From that darkest hour, the Dow Jones Industrial average rose 1,410%. Our hero in the story saw the coming stock market boom… despite the fact that everyone thought everything was bleak and black. He approached Jyske Bank and said he wanted to invest in the stock market and wanted to leverage his bets. His goal was to make enough to buy a brand new Mercedes Benz. Bubble fever had set in so when the hero’s investment manager called with that great news… “You have enough for your new Mercedes“, the investor changed his mind. “Let it roll,“… the investor said. “I want to make a million instead”. 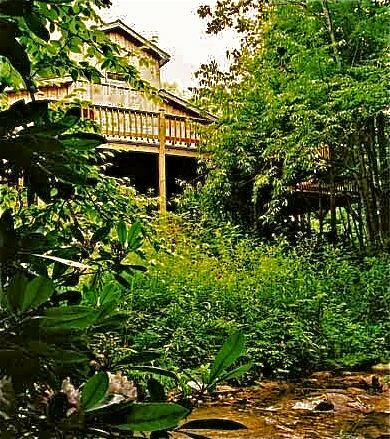 “Hold,“… the investor said. “The market will come back”. Finally as the market plunged more and profits faded away… the investor, having lost more than 3.5 million, closed his positions and had just enough profit left to buy his new car. #1: If you get into the market at the beginning of a long term bull… you can make a lot of money… quickly. #2: When you leverage the investments with low interest leverage the profits come even faster. #3: When you leverage investments… you need a plan AND a discipline. This is why I want to introduce you to our Multi Currency Portfolios Report entitled “Borrow Low Deposit High – How to Use the Multi Currency Investment Sandwich”. This is a report that can help anyone with even a few thousand dollars to invest (or millions) diversify globally for safety and long term success. The economic explanation below follows global multi currency and market positions from 2006 through to the earthquake and tsunami in Japan so you can see how multi currency investing should flow. This will help you learn how to protect and enhance your savings and wealth as the US dollar and stock markets rise and fall. The US dollar has fallen… badly against major currencies like the yen, euro and Swiss franc for 41 years. 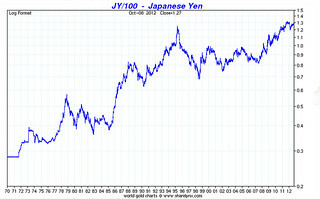 For example here is the long term, steady appreciation of the Japanese yen versus the US dollar. Three Opportunities of Which We Can be Sure. First, The US dollar will fall more…much more as stock markets in the USA and globally enter their next bull phase. Third, there will be inflation…worldwide due to the excessive spending in the current global financial bailout. Borrow Low-Deposit High helps you learn how to find good value and develop multi currency portfolios that suit specific circumstances. Before I explain how you can use this report, let’s look at both the up and down side of these high performing portfolios. The report provides an extensive beginner’s guide to developing multi currency portfolios backed up by our decades of experience working with Jyske Bank and its investment management subsidiaries to create and track multi currency portfolios real time. 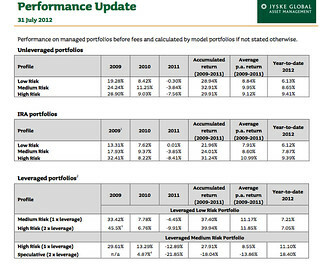 The report data comes from dissecting and discussing the portfolio results. This is a totally novel way to learn…real time from real portfolios created by some of the best investment managers in the world as these portfolios rise or fall in the market place…in the here and now. Jyske Bank assists by providing portfolio details. Our symbiotic relationship allows me to combine my experience with this bank’s incredible knowledge, real time capability and expertise so reader of my report can learn in a most practical way from some of the greatest multi currency experts in the world. Here is our educational performance over the past six years. We created five portfolios for educational purposes beginning in 2006. One of the five multi currency portfolios was the Asian Emerging Multi Currency Portfolio. The portfolio started with a $100,000 investment and a $200,000 loan in Japanese yen (more on the loans in a moment). May I, at this point, interject a note about Jyske Invest fund managers. They are a Danish firm and are the investment management affiliate of Jyske Bank. 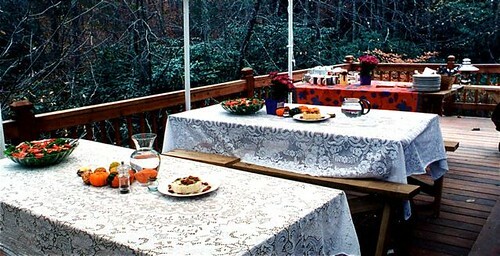 This rock solid organization uses a good value system and have been rated #1 by Morningstar. They use this value system to select shares in their mutual funds. We place these funds in our multi currency portfolios because they are strictly regulated by the Danish government and have such an excellent record…because they focus on finding value, not market timing. There you have it, a portfolio created at and held in one of the world’s safest banks. With only three trades in two years the performance has been up 114.16% in year one and up 122.62% in year two. 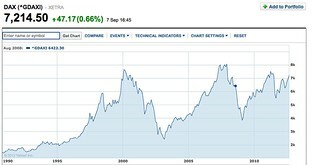 For example, the 2007 Green Portfolio consisted of six shares and rose 266.30%! You can imagine with performances like this, quite a bit of attention was attracted. However these high returns are not the important benefit you gain with our multi currency report. The report Borrow Low-Deposit High does not recommend specific portfolios. The portfolios in the report are educational and designed to help readers work with their own investment manager to create their own multi currency portfolio that suits their own special, individual needs. Our multi currency investment report helps readers learn how to manage their manager… nothing more. The report helps guide readers so they can direct any investment adviser or investment manager who understands how to invest in more than one currency. The report also helps you learn why and when to invest in shares, how to leverage, how to create discipline and manage risk. The incredible portfolio performance above was achieved because the portfolios were leveraged using a tactic we call a multi currency sandwich. Investors borrow low and invest in yielding or growth portfolios. The portfolios used loans in Japanese yen and Swiss francs to magnify profits in good times. The report teaches how these loans can magnify losses in bad times as well. 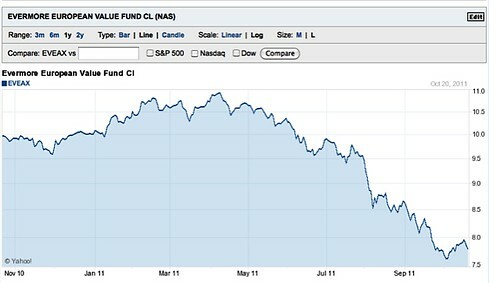 Leverage in 2008 caused the portfolios to lose badly… in one instance the total portfolio was lost! The report Borrow Low – Deposit High is useful because it helps investors not to expect rising markets all the time. The course helps subscribers learn how to look ahead and act rather than react (after the fact when it is too late). The sad fact is… we all have to become multi currency investors. Trusting your fate to any one currency now can destroy your purchasing power. Every investor needs to know what to do! The report helps learn how to look for times when to leverage and for times when to retract. The idea is to cash in when the going is good and then withdraw. Plus the report combined with our regular personal portfolio updates helps you to stay on top of currency and investment markets. In 2012 we became bullish on equity markets again and history suggests that despite the doom and gloom so many preach… we are at the threshold of the next big global economic acceleration. This is why I invite you to read my current update of Borrow Low Deposit High… in the beginning of this wave when profit potential is greatest. This nine chapter report has been read and studied by tens of thousands of investors over the years. This report has been sold for decades as a survivor’s hand guide to currency turmoil for $79 and we are not raising the price now just because the next bull market is beginning. Finally, as always, you are protected by our 30 day completely satisfied or your money back guarantee. “Borrow Low Deposit High – How to Use the Multi Currency Investment Sandwich” $79. This report is guaranteed. Satisfaction or your money back. Borrow Low Deposit High – How to Use the Multi Currency Investment Sandwich” $79. 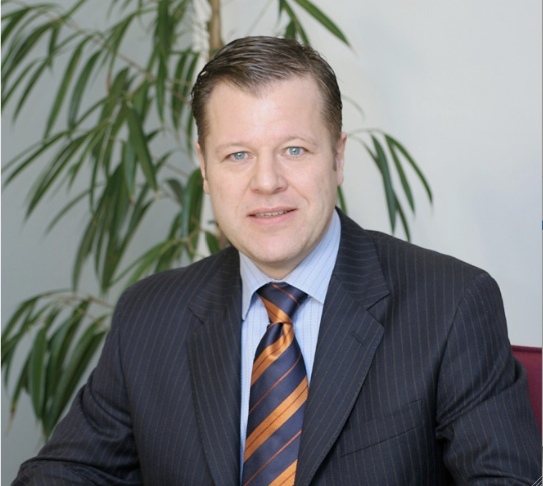 Meet Thomas Fischer of JGAM… a Danish bank that makes multi currency loans at our February 1-2-3, 2013 Super Thinking + Investing & Business course. 1990 saw one of the greatest investing opportunities in history. In the USA, a 15 year bear cycle had ended in 1982 and the Dow had quietly risen from below 1,000 to just under 3,000 by 1990. However investors sentiment takes about seven year to adjust so the US boom really began and the down rocketed from appx. 3,000 to over 11,000 by 2000 and added increase of nearly four times. The huge opportunity from 1990 however was in Europe… mainly Germany. The reunification boom of 1990 to 1992 had turned sour and the US economy was in recession. German management cut 14% of the German industrial workforce which resulted in a mild profit improvement. However German shares were trading at ridiculously low asset valuations with improving returns that led the German stock index up 60% by the end of 1993. The following 3 years proved to be very uninteresting for anyone who missed this classic trade. 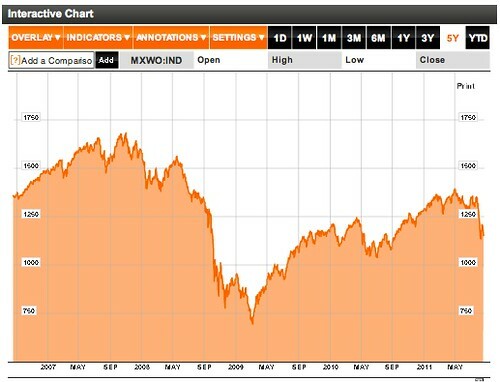 The Dax (Germany’s stock market index) rose seven times in the same period as the chart below from finance.yahoo.com shows! This could seem confusing… that the biggest growth periods began during times of recession, but this is a simple historical fact. Most investors buy shares at exactly the wrong time. 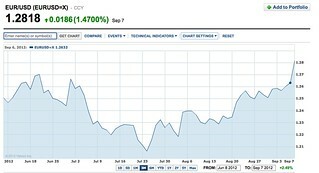 This is why when Europe was plunged into some of its deepest economic woes, I began accumulating European shares. When the banking industry seemed worse I purchased Italian and Danish bank shares and when the Italian shares crashed invested in more. Recent messages, one Aug 16, August 20 and Aug 25, (see links below) looked at my European share portfolio. Now we are seeing some new confidence in Europe and this speculation is paying off. Thomas Fischer at Jyske Global Asset Management (JGAM) sent this update. The past 5 days were another week with central banks in the limelight. Draghi of the European Central bank (ECB) played the lead role, pushing aside all negative economic data and boosting stock prices. Turning to central banks, this week was a continuation of the story of the past many weeks and months. Central banks are either expanding monetary policy or promising to expand in the near future. The Bank of England left interest rates unchanged, but is still committed to its asset purchase program. More surprisingly, Sweden’s Riksbank cut its repo rate by 25 basis points to 1.25%, as a response to a recent appreciation of the Swedish kroner (SEK). Finally, the long-awaited ECB plan for sovereign bond purchase was released on Thursday and was named “Outright Monetary Transactions” or in short, OMT. The ECB president, Mario Draghi, confirmed that the ECB is willing to purchase unlimited quantities of short-dated bonds to ease funding pressure on governments in trouble. However, the bond-purchase program requires governments seeking bailout to obey to fiscal restrictions set by the EU and monitored by the IMF. It remains to be seen, whether Spain and Italy are ready and willing to accept the “Greek troika” of EU, ECB and IMF to intervene in their economic affairs. The weak economic data and the central bank’s intervention had the effect that both the euro and gold reached new heights during the week. Today, the euro went above 127 USD and during the week gold rose to a six-month high above 1,700 USD an ounce. At JGAM we assess the dual rise of euro and gold to reflect both a temporary relief in the eurozone and a continuing fear of aggressive central bank expansion eventually leading to inflation if not rolled back in time. Already this shift has brought me profits with the unicredit shares. Unicredit shares were 3.16 euro at the time of our August 25 message. They are now 3.66 euro per share. Unicredit rebounding sine our August articles. Plus the Euro has added strength. Euro rebounding versus the US dollar since the August articles. 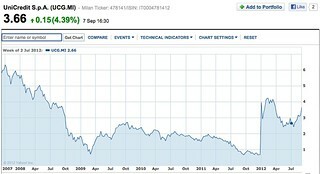 This means that on August 20, 2012… 10,000 shares of Unicredit sold 31,600 euro. Those euro at 1.23 were worth about $39,000. Today… the same 10,000 shares are worth $36,000 euro worth at 1.28 about $46,000. That is a 17% rise in just three weeks. Had one leveraged the speculation two to one the profit would have been over 30%…. in three weeks. Nice. Yes short term profits like this are nice but really meaningless and this is not the opportunity. The opportunity is in a shift of perspective that heralds the beginning of the next 15 year bull market. There are three upwards forces working in the European bank sector now. The director of European Investments at another of my investment advisers sent a note on why he felt that European banks were in his opinion the best investment proposition since 1990. 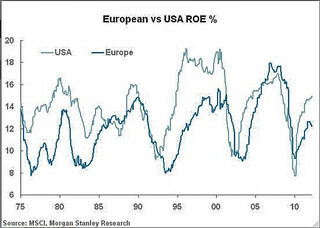 This graph shows the return on equity in both the US and Europe over the past forty years. They show a clear pattern that economic cycles should be expected and how these cycles create opportunity. Opportunity grows in recessions because regardless of what corporations face, plague, war, recession, political or energy crises… managements adjust and rebuild profits by cutting costs, reducing working capital and increasing margins through consolidation. The important point is that investors pay premium prices at the worst times when at the upper peaks of cycles when business is easy, there are bloated cost bases, over-priced acquisitions and high cash flows are being invested in increased capacity that will not be required when the cycle turns. These cycles seen in terms of return on equity rise and fall between 10% and 18%. Investors should value those profits streams differently. When the Return on Equity (ROE) is at an 18% peak investors should pay less because at the peak profits are unsustainably high. 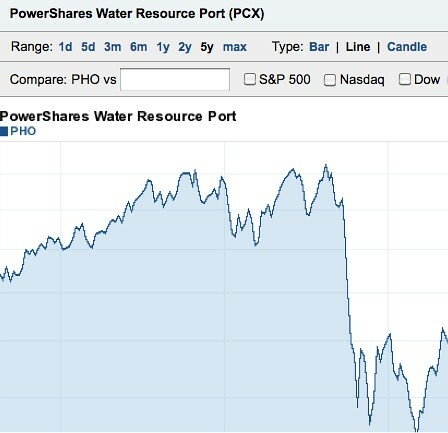 When ROE is at a low 10% investors should pay more because during the troughs profits understate true earning power. In other words investors should pay a higher multiple for lower returns and a lower multiple for peak profits because those profits will rebalance. Most investors do exactly the opposite! 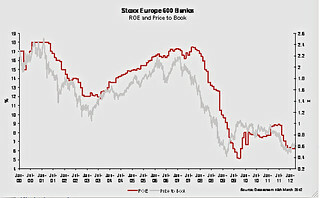 (See chart below which shows the price to book rising and falling as profits rise and fall, not the other way round). Value investors such as Warren Buffett do not make this mistake. For 40 years Buffet has been buying when asset values are cheap and avoiding over-extending when profit cycles are at peaks. Most investors err because they are overly influenced by optimistic and pessimistic newsflows and they ignore value. This basic creates a remarkable investment proposition based on the Return On Equity (ROE) and price to book of the European banking sector. Equity investors have continued to price this sector’s profit stream in a completely consistent way based on headline grabbing newsflow. Because this type of investing is totally flawed we can make Buffet-like returns. The chart below shows that return on earnings on European banks is at almost an all time low. This chart and economic logic shows that ROE of the European banking sector should move from 6% to 9% over the next three years so price to book can be expected to rise 50%. This improvement would require 20% earnings and dividend growth over the 3 year period so that your total return would be comfortably over 60%. There are three business reasons behind this rise. Lending volumes drive the quantity of the banking sector’s returns whereas net interest margins… cost/income ratios… and loan loss provisions drive the quality of returns. Loan volumes will grow modestly but the 50% rise comes from improved net interest margins, cost/income ratios and loan loss provisions. First, cost/income ratios are falling in almost all banks in Europe. This is totally under the control of management and they want to reduce costs. All the European banks are reducing staff, rationalizing branches and this cost cutting will continue through at least 2014. Second, net interest margins will improve at almost all European banks. Interest rates are almost at zero and aren’t likely to rise any time soon. However loan costs are rising. This began in Denmark. All the major banks have hiked loan costs on three occasions in the last eight months. Italy, and Eastern Europe hiked their costs next. I was happy to see this since my shareholdings and those I have been recommending are in Jyske (Danish and Unicredit (Italy and Eastern Europe). This is why I also added Skipton Building Society bonds paying almost 10% because investors have also underpriced British Building Societies. Third, loan provisions are set to fall pretty aggressively from now onwards. The emergency provisions associated with the 2011 chaos have caused the current lending practices to be much safer and conservative than those from 2005 to mid-2008. Portuguese banks for example only grant individual mortgages to those who put down a 40% deposit and to export oriented businesses. European loan books are being massively derisked. Loan books at end 2014 will have no semblance to anything that was created by the easy credit conditions in 2006 & 2007. Here are the three big moves that can bring such great opportunity. 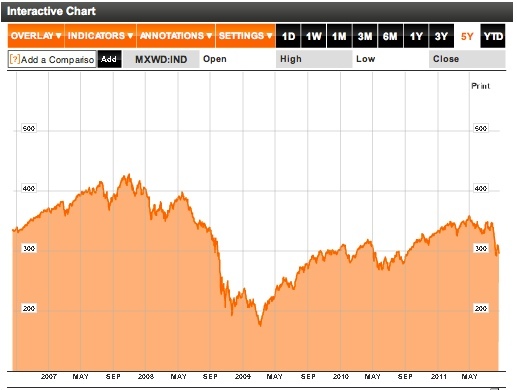 #1: End of the the 15 year bear and a rising stock market while investor sentiment remains bearish. #2: The return to a falling US dollar. #3: Low interest rates so investors can borrow low and invest high at almost no cost. The time of greatest investing opportunity are the first seven years or so of a 15 year bull market when investor sentiment remains low. Big smart money pours in and takes profits in the later years as a bubble forms on positive investor sentiment and news. The last great opportunity began around 1982 through 1990. This new bull form has an added advantage of much lower interest rates than in the early 1980s and we will focus on the opportunity now and the advantages (and pitfalls) of Borrow Low-Deposit High speculations at our upcoming Super Thinking + International Investing and Business Seminar October 5-6-7. 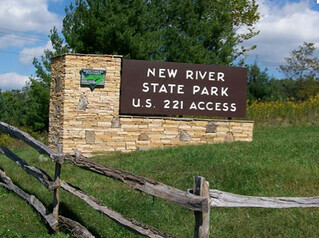 This October Course is special because we’ll conduct it at New River State Park near West Jefferson, North Carolina. One multi currency portfolio is up 18.4%. Long term readers at this site know that Jyske Bank has been my main investment banker for around 25 years. I study their portfolios regularly to learn ideas on where to invest and their recent updates show how today’s global economic environment forces us into taking greater risk. Long term readers also know that I do not recommend holding more than needed for day to day spending in Ecuador banks. If you are a new reader see my Ecuador bank warning here. Thomas Fischer Sr. VP at Jyske Global Asset Management, the division that serves American investors, sent this note last week. Hi Gary, Attached our latest performance update. We are pleased with the performance and all portfolios (except the FX but hopefully we will still make a profit by the end of the year) are beating the benchmark. We have no exposure to the euro and in our leveraged portfolios we use a 100% euro funding. As you can see this has also led to a return of 18.4% in a speculative performance (medium risk with 2X). Click on this photo to enlarge. There is an important multi currency lessons to be learned here. · During the second quarter financial reporting season a surprisingly large number of companies have reduced their earnings forecasts. · Financial markets are very optimistic that both the Fed and the ECB will and can boost economic growth and solve the euro crisis – we are however less confident. · So far this year we have a satisfactory performance on all our asset allocation portfolios which we want to protect to some extent in case the Fed and the ECB disappoint market expectations. Therefore, we have sold the following stocks in medium and high risk portfolios: Cisco, Siemens, Novo Nordisk and China Mobile. In the low risk portfolios we have sold Vodafone, Nissan and a portion of Apple. All chosen stocks are considered to be of the more risky type. Further, we have bought more gold and hence, increased the position we already have. In case the Fed and/or the ECB engage in another round of monetary easing we expect some of the excess liquidity to flow into gold. Finally, we have put a protective stop-loss on our euro loan in the leveraged portfolios, in case the ECB manage to live up to the market’s high expectations, relieving the euro crisis and hence, cause a euro appreciation. Bottom line is that we are still invested, but now with a less aggressive investment strategy, thereby protecting your investments with us to a larger extent. And again, we emphasize that we are NOT exposed directly to the euro or any euro stocks and bonds. Global stocks started the week in a mood of optimism, drawing strength from Friday’s solid US jobs report and signs from Spain that the government could request a bailout, opening the possibility for support from the ECB in the form of a bond purchasing program, announced by ECB’s president Draghi last week. Tuesday, the Reserve Bank of Australia kept interest rates on hold at 3.5% which caused the Australian dollar (AUD) to reach its strongest level in more than four months. However, mid-week the market sentiment changed and stocks struggled to sustain recent gains. The reasons were bad news from Germany, the UK and Greece. Germany reported industrial output and exports that fell more than markets had expected. Further, the Bank of England cut its economic growth forecast sharply. Also, Standard & Poor’s lowered the outlook on Greece’s credit rating to “negative” from “stable”. Then, Thursday the sentiment changed again and global stocks moved higher on hopes for additional monetary stimulus to struggling economies, especially in China. Both factory output and inflation in China slowed. These bad economic news were turned into positive financial market news as they spurred new hopes for central bank intervention. Friday – as we write – the sentiment has changed once again. Growth-focused assets, especially stocks, are being sold after disappointing Chinese trade data. It seems as if the market has decided to end the week on a downbeat note using the Chinese trade data as an excuse for some profit-taking. At JGAM, we conclude that the positive impulse from last week’s US job data and ECB’s promise on a bond purchasing program didn’t last for long. Financial markets are again nervous and volatile, faced with sluggish economies and an unresolved situation in the eurozone. However the best performing portfolio at JGAM, up 18.4% is their most speculative… the medium risk portfolio leveraged two times. This repeats an interesting multi currency investing phenomenon that we have seen numerous times in the past several years. This phenomenon is that a lower risk portfolio using leverage brings the highest returns. This is one reason why I have used Jyske for so many years… they provide multi currency lending. When a currency like the dollar, euro or yen is weak… you can borrow at a really low interest rate to invest for a higher return. For example in the example above, instance JGAM’s medium risk portfolio is up 7.87%. However because the portfolio is leveraged with a low cost loan in euro in the 3% range, the leveraged portion earns about 4.5% plus has the potential of a forex profit. Leverage can also work against a portfolio in the downside… but in this era when bond yields are really low. commodity prices are very high and volatile… good value shares offer the best long term potential. That potential can be enhanced with these really low interest rate loans and this creates a very powerful long term strategy. Warren Buffet exemplified this fact at his 2012 annual meeting when he described investments in bonds as: “bonds are more like “return-free risk” than risk-free return”. “A productive asset of any kind, a decent productive asset, is going to kill a non-productive asset over time. Good value equities have always offered the best long term value and when leveraged with low costs loans they can provide enhanced returns. Join me with Thomas Fischer to look at how you can borrow weak currencies to invest into 2013 at our upcoming Super Thinking + International Investing and Business this October 4-5-6. Jyske Bank Private Bank just announced a down grade. 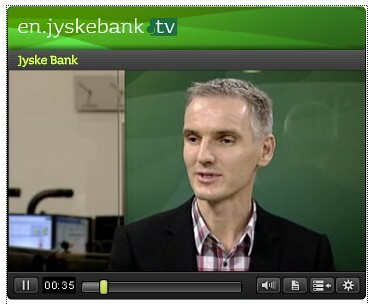 Steen Nygaard Head of Treasury at Jyske about the downgrade on Jyske TV. See link below. In mid-November, Standard & Poor’s revised its view of the banking sector in Denmark, including Jyske Bank; this revision took place according to Standard & Poor’s updated BICRA method (Banking Industry Country Risk Assessments Method). Due to the continued economic uncertainty and the expectations of low economic growth, Standard & Poor’s lowered its general rating of the Danish banking sector. In line with this, Standard & Poor’s has now downgraded Jyske Bank’s long-term rating from A to A- and the short-term rating from A-1 to A-2. At the same time, Standard & Poor’s changes its outlook for Jyske Bank from negative to stable. “‘I understand the change in Standard & Poor’s view of the prospects of the Danish banking sector and hence also its rating of Jyske Bank. Jyske Bank cannot expect to maintain a rating at the same level as in 2006 when Standard & Poor’s rated the Bank for the first time. At that time, economic prospects were brighter and the earnings level of Jyske Bank higher. The most important thing is, however, that Standard & Poor’s still recognizes Jyske Bank’s strong position in respect of funding conditions and capital structure. There are several positive factors to keep in mind. First Denmark remains ranked AAA and Scandinavian currencies remain a safe place to be. See more on this here. Second, deposits are guaranteed by the danish government up to 100,000 Euro or $135,000 US dollars. Third, securities… ie stocks and bonds are not affected by this downgrade. Your investments at Jyske are kept separate in a nominee account, In other words client holdings are separated from the banks own holdings so are protected by their own financial stability. See more on the Jyske downgrade at Jyske TV here. Now is the time when value is most accessible but also when it is hardest to believe in value. Can you believe that performance like this is good? See below why I am smiling over this. Belief is one of the most important assets you can have when it comes to investing… unless you are a trader. On September 23, 2011 Jyske Global Asset Managers wrote: Dear client, On 22 September, JGAM’s Investment Committee held an ad hoc meeting deciding to sell bonds denominated in Australian dollar (AUD) and Brazilian real (BRL). These trades have now been carried out. We sold the AUD bond with a nice profit and the BRL bond only gave us a small loss. This was a good decision and we passed it on in our message entitled Multi Currency Tip: Sell Australia and Brazil. Then outlined why I was not selling my Australian and Brazilian positions. Yesterday my portfolio accountant (I make my own decisions) wrote: Gary, Please find an update of your portfolio attached. Even with your conservative strategy, you have lost 7.1% in one month. This last month have been the most negative since October 2008, mostly because the US Dollar has appreciated against all emerging market currencies, especially Brazil. This growth is mostly because of problems in Greece and the outlook for a lower world wide growth. A quick look at The US dollar versus the Australian dollar and Brazilian real versus the US dollar shows how both currencies collapsed to the greenback. I had a long talk with Thomas Fischer who is head of the currency team at Jyske Global Asset Management. They currently have 40% of their portfolio in US dollar cash… hating this but seeing nowhere else to go and knowing that incredible deals will be coming up… because the US dollar strength is not likely to last. Here is the point about belief. JGAM and I have almost identical beliefs in the market. We simply have different ways of responding to these beliefs. As managers of wealth for many investors, JGAM has to to perform in the medium term because JGAM customers may require funds at any time. JGAM are not traders… but they can be when required. As manager of my own funds I know when I’ll need liquidity and I can manage my own account with a longer view. JGAM also wrote last week: Europe is waiting for the result of the European summit over the coming weekend and the markets are prepared to react. This week, we had a market reaction every time rumors appeared or statements were given by officials. The result has been volatility in all markets. The EURUSD has traded between 136.50 and 139.17. Reactions like these are massive compared to the actual news value of the statements. The size of the European Financial Stability Facility (EFSF) has been subject to much discussion this week. During the week, there have been several more or less serious estimates on the size of EFSF, which have only added to the uncertainty. Monday, the English newspaper The Guardian disclosed that the rescue package would be increased to 2,000 billion euro’s, which was received very positively by the markets and resulted in a positive day. As no official confirmation was given, once again the positive sentiment disappeared resulting in falling markets. The latest news is that we will see a postponement till Wednesday next week. The reason for the new summit, according to several newspapers, could be the fact that Moody’s, have indicated that France might lose their AAA rating – a serious problem for the entire solution. Angela Merkel also needs the additional time to clear the negotiated solution with the reluctant Bundestag. Once again, this indicates that the European problem is very difficult to solve and that a solution could drag on. In the meantime, the rest of the world is just waiting – for Godot? This week, 24 Italian financial institutions were downgraded by Standard & Poor’s. Last week, a great number of Spanish and English banks suffered a similar fate, which certainly doesn’t contribute positively to the general sentiment in the market. China has published the GDP (YoY) and the figures came out at 9.1%, down from 9.5% last quarter. The Chinese economy is slowing down, but is not in for a hard landing. It also indicates, not surprisingly, that the crisis in Europe has had a negative effect on the global economies and hence it is of great importance that a sustainable solution is found. The stopgap measures we have had so far will not satisfy the markets today. There seem to be so many problems. Problems create value! If the big problems are in Europe right now. Sure enough a message next week reviews Keppler Asset Mangemet’s Global Major Market Value analysis and we’ll see how four of the six top value markets are in Europe. This means that one way to cash in on value now is with a European Value Fund. 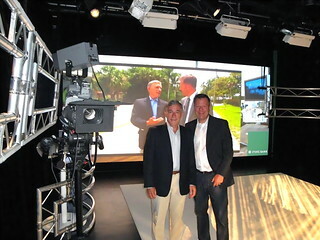 One new such fund the Evermore European Value Fund started last year in New Jersey. There’s a yearly 0.25 percent 12b-1 fee for marketing expenses for the A shares if you buy shares through one of the platforms like Fidelity, Schwab, or TDAmeritrade. The minimum first investment is only $5,000. The manager is David Marcus, co-portfolio manager is Jae Chung. Marcus is well known as a deep-value investor, one who rushes in when blood is running in the streets. He’ll find plenty of blood now. Value funds are not for the feint of heart during such difficult economic times. They typically look and perform the worst during the downward slide as managers pick up lopsided falling shares. During recovery is when value investors and value funds really smile. Marcus worked with Michael Price, who learned the ropes from another legendary deep-value investor, Max Heine, who launched the Mutual Series funds in the 1940s. These funds have a winning reputation and Marcus worked there for almost 14 years. He was the sole manager of the European fund at Mutual and co-managed many others so was managing over $14 billion in funds. Evermore funds unlike regular ETFs can sell short, buy bonds of companies in trouble and a lot of things that hedge funds do. Yet as closed end funds they are liquid at all times… though you would want to buy for the long and medium term now. When I show you a chart of the performance of this fund in its first year, you may think I have gone nuts. The return looks really lousy as any value fund or value oriented portfolio will look right now. Value funds perform worst in bad times because the mangers are busy gobbling up good value equities BEFORE they rise in cost. Value investors smile on the recovery side… not during the crash. In times like this almost everyone loses except professional traders and short sellers. Almost everyone becomes happy when equity markets recover… but those who are the happiest and who do best are value investors. If you believe in investing value… and you should… this is a time to be happy. Some great bargains have developed and more are developing now. Learn more about Multi Currency investing here. Why Be a Multi Currency Investor Abroad? Three reasons why we should all be multi currency investors abroad and can help us create an international micro business opportunity. 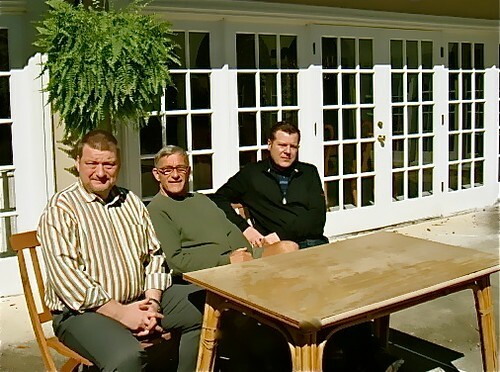 Gary Scott meeting with his JGAM advisers Anders Nielsen and Thomas Fischer. See how this can help you begin a business. Listen to an interview with Thomas Fischer about the JGAM Introducer program here. More Americans are starting their own businesses than ever before. Necessities created by global economic evolution and the chance created by modern technology to get out of the rat race to really pursue one’s dreams have developed this huge evolutionary flow. Readers can gain enhanced success from our online courses on how to develop any type of micro business. If you have an idea or have started your own business, our courses can help… but if you don’t have a business idea, our turnkey business program can assist you even more. One idea is to be an introducer to Jyske Global Asset Management. Why bank abroad? Because there are three good reasons why one should hold assets abroad. First, European banks have more experience in multi currency investing. Second, European banks provide more service in multi currency investing. Can your US banker offer you accounts in three, four even a dozen currencies and provide you loans in euro and yen? Most overseas banks can. Third, European banks offer asset protection. Loss of assets through litigation and liability are major concerns on the USA. Now there is a growing concern… government seizure of the assets of totally innocent people. This is already a problem and as local governments have tighter budgets during the economic downturn this trend may grow. New York businessman James Lieto was an innocent bystander in a fraud investigation last year. Federal agents seized $392,000 of his cash anyway. James Leito, far right, fought to recoup $392,000 seized in a fraud case in which his small business was an innocent bystander. An armored-car firm hired by Mr. Lieto to carry money for his check-cashing company got ensnared in the FBI probe. Agents seized about $19 million—including Mr. Lieto’s money—from vaults belonging to the armored-car firm’s parent company. He is one among thousands of Americans in recent decades who have had a jarring introduction to the federal system of asset seizure. Some 400 federal statutes—a near-doubling, by one count, since the 1990s—empower the government to take assets from convicted criminals as well as people never charged with a crime. Last year, forfeiture programs confiscated homes, cars, boats and cash in more than 15,000 cases. The total take topped $2.5 billion, more than doubling in five years, Justice Department statistics show. “We are paying assistant U.S. attorneys to carry out the theft of property from often the most defenseless citizens,” given that people sometimes have limited resources to fight a seizure after their assets are taken, says David Smith, a former Justice Department forfeiture official and now a forfeiture lawyer in Alexandria, Va.
Forfeiture law has its roots in the Colonial days, when it was used to battle pirates and smugglers. In the 1970s and 1980s, Congress began giving law-enforcement officials power to go after the assets of other criminals, such as organized-crime figures. The more than 400 federal statutes allowing for forfeiture range from racketeering and drug-dealing to violations of the Northern Pacific Halibut Act, according to a December 2009 Congressional Research Service report. The report shows that seizure powers were extended to about 200 of those laws in 2000 in a major congressional overhaul of the forfeiture system. Raul Stio, a New Jersey businessman, is caught up in the civil-forfeiture world. Last October, the Internal Revenue Service, suspicious of Mr. Stio’s bank deposits, seized more than $157,000 from his account. Mr. Stio hasn’t been charged with a crime. In a court filing in his pending civil case, the Justice Department alleges that Mr. Stio’s deposits were structured to illegally avoid an anti-money-laundering rule that requires a cash transaction of more than $10,000 to be reported to federal authorities. 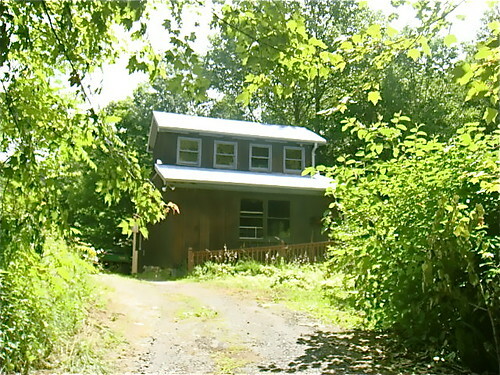 Mr. Stio made 21 deposits over a four-month period, each $10,000 or less, the filing said. Steven L. Kessler, Mr. Stio’s attorney, says there was no attempt to evade the law and that the deposits merely reflected the amount of cash his client’s businesses, a security firm and bar, had produced. Mr. Stio was saving to buy a house, he says. It’s tough to know how many innocent parties may be improperly pulled into the forfeiture system. Last year, claimants challenged more than 1,800 civil-forfeiture actions in federal court, Justice Department figures show. Part of the debate over seizures involves a potential conflict of interest: Under a 1984 federal law, state and local law-enforcement agencies that work with Uncle Sam on seizures get to keep up to 80% of the proceeds. Last year, under this “equitable-sharing” program, the federal government paid out more than $500 million, up about 75% from a decade ago. The payments give authorities an “improper profit incentive” to seize assets, says Scott Bullock of the Institute for Justice, a libertarian public-interest law firm in Arlington, Va. It’s a particular concern amid current state and local government budget problems, he contends. Justice Department officials say the 8,000 state and local agencies in the equitable-sharing program have greatly expanded the federal government’s ability to go after criminal activities, particularly the movement of drugs and drug cash along the nation’s highways. The program is monitored to ensure seizures are handled properly, they add. The judge’s order said the case produced “overwhelming evidence” that the funds were clean. Jorge Jaramillo, a construction worker, says he couldn’t afford a lawyer after more than $16,000 was seized from him last year in a traffic stop. “I had all of $20 left,” he says. In a Delaware federal-court filing, the Justice Department argued the money was related to drug dealing. It pointed to air fresheners in the car, which could mask the smell of drugs, and a fast-food bag containing cigar tobacco, which the filing said was often a sign that the cigar wrapper had been used to smoke marijuana. The filing also said a police dog had signaled that the cash carried residue of illegal drugs. Such “dog sniffs” are a common but controversial feature in forfeitures. 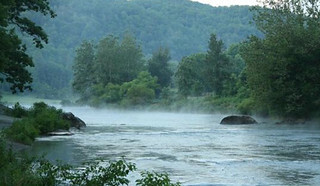 Mr. Smith, the Virginia attorney, represented Mr. Jaramillo at no upfront cost. In court documents, Mr. Jaramillo, who wasn’t charged with a crime, said he was carrying the money because he was traveling to buy a car from a seller who wanted cash. The government in May agreed to return Mr. Jaramillo’s money, with interest. Mr. Smith was also awarded $6,000 in attorney’s fees. Under Cafra, attorneys’ fees in civil-forfeiture cases are at least partially payable if the claimant wins. Mr. Lieto, the New York businessman, discovered the frustrations an innocent party can face as he worked for months to keep open his check-cashing business after federal agents seized his firm’s working capital. Under the law, an innocent third party generally can’t seek an asset’s return until the underlying criminal case is resolved, which can take time. This problem that has been around for some time. In the mid 1990s, Reason Magazine told incredible tales of seizures across the USA, from California to New Hampshire, Florida to Idaho. An excerpt from that article (which is linked below) shows how anyone with over $100 cash was targeted for seizure: Daytona Beach. In June 1992, the Orlando Sentinel revealed that Volusia County Sheriff Bob Vogel had created a special police drug squad which preyed upon thousands of innocent motorists driving on U.S. Interstate 95. Operating under a broadly written Florida law allowing police seizure of cash and property based on probable cause without arrests in suspected felony cases, the police engaged in pure highway robbery. 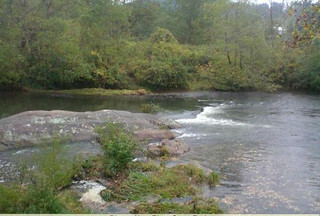 Police conduct was guided by no written rules and reviewed only by the sheriff, who controlled all funds confiscated. Any motorists stopped who had $100 or more in cash were assumed to be a drug trafficker, and their money was taken. From 1989 until the bad publicity in 1992, the squad seized more than $8 million in cash from motorists, mostly blacks and Latinos, and in only four cases did the innocent owners get all their money back. Yet the concerns about unfair seizures may grow. As the economy works its way through a low ebb, counties and states desperate for additional finance are encouraged to grab more. Holding assets outside the US makes it almost impossible for assets to be confiscated without due process. There are other benefits to holding assets in more than one banking system… added safety… increased broader and more multi currency services… but asset protection is a major reason to bank in more than one country. This fact also creates a business opportunity wherever you live. Our online business courses about can help anyone who has a business idea. For those who want a turnkey start up, we have started a program to help our readers create their own micro business working with these businesses we have used and like ourselves. You can become an introducer, referrer, dealer or distributor to a number of businesses we recommend. This creates really unique global business potential tied together with our communication system… training… communicating and networking. An introducer does not have to be a registered as an investment adviser but JGAM does have a due diligence requirement. JGAM will also expect a certain amount of referrals per year though this amount has not been determined… hence this beta offer. JGAM pays a percentage of their fee to the introducer up to a maximum 25% of their fee. This not only offers an excellent income generating opportunity but creates a potential long term income stream because JGAM keeps paying the fee as long as the client remains a client. Fees are paid on a quarterly basis. There is also potential for growing long term income because JGAM pays the introducer based on the total assets under management. If a referred client makes additional payments, the referrer will be paid on the total amount. For example if an introducer refers a client who invests a minimum $100,000 and the annual fee is 2%, the referrer earns $500 per annum basic fee (as long as the customer remains with JGAM)… plus if the assets grow either through portfolio growth or added deposits… so too does the referrer’s fee. This program will allow subscribers to any of our online courses who have attended an International Business Made EZ seminar to become introducer for JGAM. To start as a introducer, there is first the compliance process with Jyske Bank. Once that process is complete, our IBEZ system helps educate and assist the introducer. First… once a introducer has been approved by JGAM, and the introducer has completed our online course International Business Made EZ course and attended one of our international investing and business seminars they can attend an exclusive training seminar at our farm. JGAM and our company conduct this one day intensive training for introducers the day after each International Investing and Business seminar. Part of the JGAM program is designed so we can assist referrers by referring readers in their locale to them. So for example if an introducer is in Miami, we will send special emails to our readers in that area, help organize mini seminars… etc. We will also provide an introducer communication forum and update training as well as portfolio and investing ideas. We have general plans at this stage but find the best way to develop systems is to refine through action. We expect our beta program this year to clarify how we can best help our readers become introducer and how we can help them succeed. Thomas Fischer senior VP JGAM. This will begin the process of establishing a relationship with JGAM. Once this relation is approved and verified, then you will be able to enroll in the introducer training. There is no guarantee that JGAM will approve your application as a introducer just because you enroll in the seminar or take the online course so we make two special guarantees. Third Guarantee. Your earnings potential has this guarantee. First, any time between now and October… before you attend the International Business and Investing seminar if you fail to qualify as a JGAM introducer or change your mind before attending the International Business and Investing seminar you can ask for a full refund. 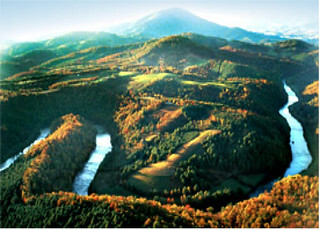 Join us for our October 7-9 North Carolina Course click here for details.